Vice President of Finance and Planning, David Walker announced on February 19 that undergraduate tuition, fees, room and board will be increasing by 2.23 percent next school year. “This is the lowest increase I’ve seen in my eight years here,” Walker said. The plan is to keep comprehensive fee increases under 2.25 percent per year. Walker desires to slow down the trajectory of us being on a course to get to $50 thousand per year. “I don’t want us to be there anytime soon,” Walker said. The chart details the increases in tuition and room fees. The total of $900 more tuition dollars per year is due to the college’s continuously rising cost structure. The maintenance of buildings and the salaries of faculty, staff and administrators are also factors. Besides the cost of doing business, Messiah needs more money for financial aid packages since recruitment has become more difficult. Messiah’s recent upgrade to university status may help especially with the recruitment of international students, but possibly of undergrad as well. 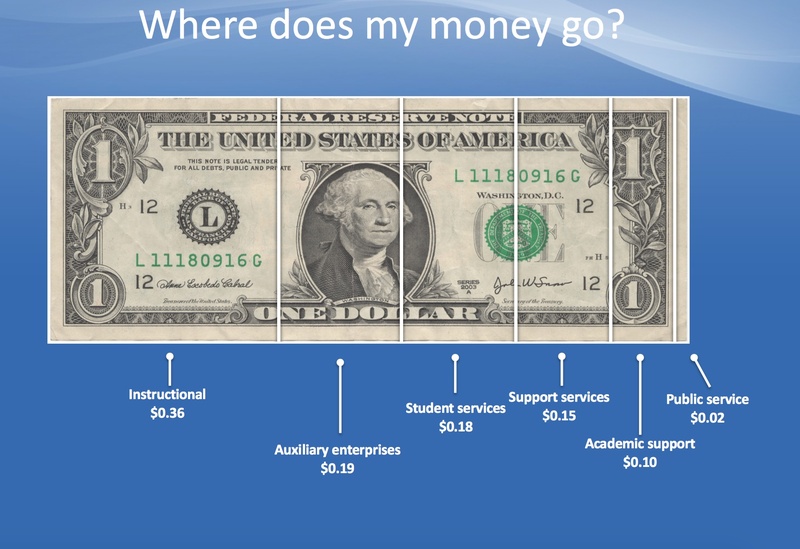 Graphic explains where each student tuition dollar goes.